Capitalism for most people means people and corporations make the most money they can and accumulate as much wealth as they can. This is wrong, at least according to the Austrian school of economics taught and practiced at the beginning of the last century by Carl Menger and Ludwig von Mises in Vienna, Austria—hence, the name. And that idea of capitalism was even mainstream up until the 1950s. Today few universities teach it and neoclassical economics, monetarism, and Keynesianism take precedence in practice. Correctly understood, saving, as well as correctly understood consumption, are oriented toward life. This doesn’t mean the ideas propagated in the school aren’t valuable. It teaches a system of capitalism far more in tune with the resources the earth provides and with the human spirit than, for example, the pure profit motive of the neoclassical school. It’s a comprehensive explanation of the real capitalism of the Austrian school as well as its time-tested investment principles using many original quotes and themes of the great thinkers of the school, such as Ludwig von Mises, Friedrich Hayek, and Carl Menger. The verdict on the current state of affairs isn’t pretty. 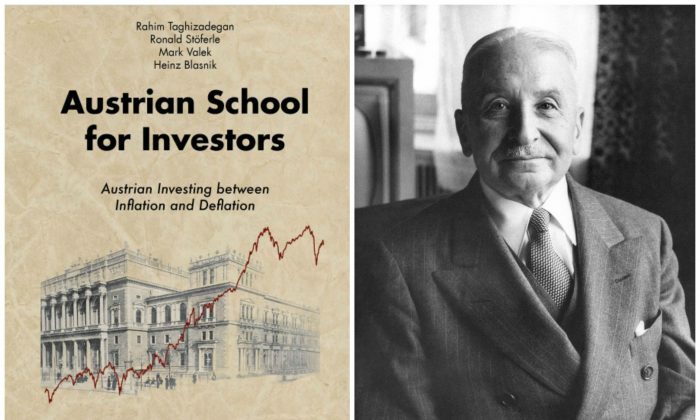 “The Austrian school makes clear why the so-called orthodox perspective on the economy, savings, and investment borders on irresponsibility,” authors Rhim Taghizadegan, Ronald Stöferle, Mark Valek, and Heinz Blasnik wrote. Many people have a feeling that there is something wrong with the current economic setup and that the American Dream of days’ past isn’t working anymore. The reason according to the Austrian school—a warped incentive system. “Markets, prices, and interest rates are instruments that serve to coordinate the actions of countless different human individuals. If these institutions of the division of labor are distorted, coordination is impeded,” the book states. Here the authors mostly mean our debt-based money system, where the central bank sets the most important price of the economy, the rate of interest. The interest rate describes the trade-off between the savers who forgo consumption today to give their money to entrepreneurs who then use the money to create capital, which benefits society. If the interest rate is determined by the market rather than a central authority, savers will save enough to give entrepreneurs the means to produce what society needs. If the interest rate is too low, as it is now, consumption morphs into consumerism and entrepreneurs produce things that society doesn’t need. The decisive point is the combination of government and private initiative: the government shows the way, enforces its wishes against all opposition. The market is better at setting rates and prices than the government because the market reflects a myriad of individual decisions each containing unique information the central authority could not possibly have access to. Today central banks claim to have all the information to make good decisions about interest rates, but the Austrian school takes a more pragmatic approach. The same is true of government interference in the marketplace as well, which leads to corruption because of centralized power, which we see now in the favorable treatment of corporations and banks. Oh yes, the greedy entrepreneurs and investors, what does the Austrian school have to say about them? The basic message is that neither investment nor business is about greed. It’s about providing value to others through honest means. “A company produces profits if it closes a gap in the structure of the economy, which exists due to the mistakes made by other actors,” the book states. “The value added is not at the expense of other factors such as labor, but a signal that certain factors have not received their full valuation by the marketplace.” In other words, the company succeeds by providing a better allocation of resources, benefiting society as a whole. Advertising and politics ever more blatantly demand more consumption. the good or service must be made available to people at the proper place and point in time. This is different from many products offered today, which mostly do not fulfill the above criteria and are based on marketing only. Consumption is mostly financed by debt and not productive activity. Again low-interest rates funding the debt play an important role. None of the Austrian scholars advocated acquiring more wealth than necessary to achieve one’s goals, vastly different from the profit-maximizing assumption of the neoclassical school. “The Austrian School for Investors” contributes to the philosophical debate about how a real capitalist system should be run and probably answers a lot of questions critics of the modern bastardization of capitalism have. But it doesn’t stop there. It also has an informative section about money and gold and some time-tested principles for saving and investment, as well as a little bit of speculation. If you haven’t heard of the Austrian school or haven’t studied it properly “Austrian School for Investors” provides an easy yet comprehensive introduction to this timeless school of thought that has many practical benefits.